Canary Islands is the paradise destination for European tourists during autumm-winter seasons. It is 20º-30ºC the whole year, so the warm and sunny weather is almost always guaranteed. One of the most popular islands is Gran Canaria. The island is divided into northern (with the main city) and southern (with the tourist areas) parts. The capital city, Las Palmas de Gran Canaria, is almost permanently clouded, as the vapor from the ocean condenses at the mountains nearby. But in the south of the island, it’s sunny the whole year. The most popular nudist area on the island is Maspalomas. These are natural dunes, with some protected areas (natural park) to keep the fauna and flora. That’s why it’s not allowed to build anything there. So the dunes are vast: a few kilometers of soft sand. 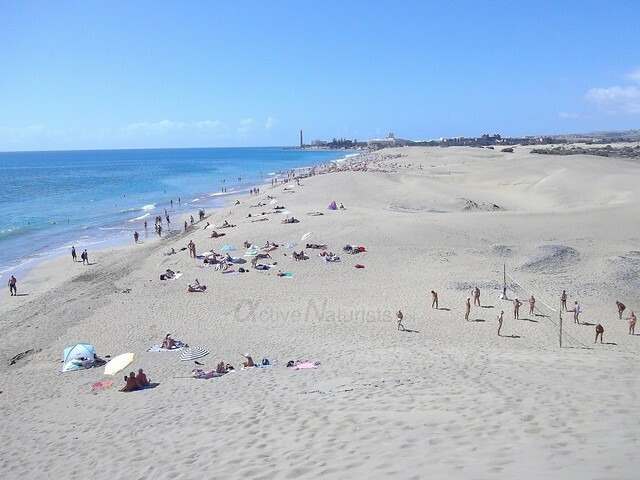 Almost the entire coastline of MasPalomas is naturist or at least naturist-friendly. There are some clothed areas near the villages of Costa Meloneras and Playa del Ingles, but with a short (and nice) ten-minute walk, you can reach the nudist area. The water is a little colder than in the Mediterranean, but it has a nice and soft sand floor. I would like to come back every year! Great Pics!!!!!! Looks like fun !! I’ve been there. My experiences there were great. You pics bring back those memories. Stay naked! We were created to be naked!